Madonna’s first seven Number Ones spanned five years – a major run in itself. Then there’s an eight-year break, and then her final six – which begin with “Frozen” – take a full decade. This second sustained period of success – taking an arc of gentle decline and bending it back to her liking and her terms – is astonishing. How did she do it? Madonna’s years away from number one were hardly an exile – her experiments, her shifts in technique and priorities happened in public with a string of Top 10 singles. Ray Of Light seemed like a comeback because it felt so focused and complete, not because she’d been away. But for these purposes, she has. And there are three main differences between the 1990 Madonna and the 1998 one. They’re not all completely positive, but they’re sustainable – they set her up for that long career still to come. “Frozen” is a showcase for all three of them – a perfect return, if not a perfect single. The first shift is in the singing. Around the time of her starring role in Evita, the last bits of New York scrappiness dropped out of Madonna’s voice. “Frozen” gives us a restrained, trained singer – releasing a huge, slow ballad as the first single from a new album is designed to emphasise that. Madonna sings “Frozen” with conscious delicacy, gently and sadly holding back – even on the chorus – as if her lover’s heart really is a brittle, fragile ice sculpture, something that pressure or anger might shatter. This more kindly Madonna rarely creates the urgency, the stakes, the sense that the moment of the song matters desperately to her (and you) that her 80s singles did. But those instances come hard in anyone’s thirties, and on “Frozen” the tender approach works. The second shift, which parallels the first, is in her language. Ray Of Light dates from Madonna’s most spiritual phase – her fascination with Kabbalah in particular. And as her interest in Jewish and Eastern mysticism grows, her lyrics take on a less situational, more universal cast. The scenario in Frozen is simple, and expressed in the widest possible terms, lines like “let all the hurt inside of you die” delivered more like a guru than an ex. Madonna lyrics from this point are often very broad – aphoristic, even. Again, this isn’t always to the good. “If I could melt your heart / We’d never be apart” is not the most striking chorus, however grand its setting. But its setting is very grand, and this is the third shift – a change in how Madonna works with her collaborators. Songwriting and production partners were always very important in her work, but they were generally long-term artistic relationships – Patrick Leonard, her co-writer here, dates back to the 80s records, but this is his last album with Madonna. Jellybean Benitez, who helped her sculpt her early sound, has long gone. Instead – starting with Nellee Hooper and Bjork on the Bedtime Stories album – Madonna now begins to work with musicians and producers with a very specific sound, changing personnel each record. The unfortunate result of this, critically, is that while the producers she works with – William Orbit, in this case – get a deserved portion of credit for each record, Madonna’s own contribution is occasionally downplayed. But this is the way of working of a woman who is clearly in absolute control of what she produces and how it sounds – it’s much better to think of her from the mid-90s on as a James Brown style bandleader, sustaining her career by cherry-picking young musicians to work with and ensuring she gets exactly what she wants out of them. 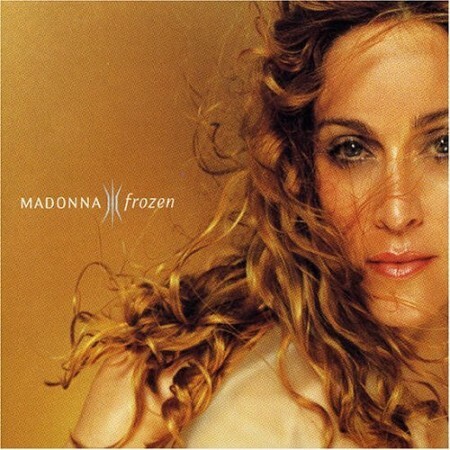 In this case, what makes “Frozen” such a good record isn’t picking William Orbit to produce it or Craig Armstrong to do the string arrangements, it’s realising how magnificent those elements might sound together. Orbit’s drum and electronic programming on “Frozen” is extraordinarily abstract for a global smash – a kind of cold, bassless dub approach, where the gaps, echoes and drop-outs matter as much as the beats, which spread sharply, like sudden cracks on a frozen surface. They need Armstrong’s strings to hold the song together. And those strings in turn – a dark, Arctic sea of swells and crests – need the beats to sound more perilous than comforting. The overall effect is stunning, especially when all three parts – the drums, the strings, Madonna’s imploring voice – peak together for the chorus. The sea beats against walls of ice, the song rises to its full, imperious force, and you feel it must be working – the lover must be hearing. But each time it dies away, and by the end of the song she gives the fight up. Some people refuse to change. But Madonna is not among them. I first encountered Orbit on a Sasha and Digweed, Northern Exposure comp in 1997, the Water From A Vine Leaf (Xylem Flow Mix) to be precise. Still sounds pretty great. It’s not often that case that I prefer the “grown up” section of an artist’s career but I have a real soft spot for Madonna’s work in the 90s – more so than her imperial phase in fact. The singles from Erotica and Bedtime Stories put my view of her a bit askew in general. The Ray of Light album seemed to be the culmination of this in some respects; taking the things she’d be doing over the previous few years and, in particular with the title track, grafting it onto her sense of pop/floor-filling/call it what you will. For me, this period’s the best of her career – a minority view, I would suppose. Accordingly, I have loads of time for Frozen – its mix of Massive Attack, William Orbit and Madonna touches the right spot for me. I suspect that a key release/work that informs this would be the version of Marvin Gaye’s I Want You that Madonna recorded with Massive Attack in 1995 (itself a record that I love) – tonally it seems in a similar place but with the lyrics being a vengeful take on the person that she wants, the right way, but wants them to want her too, railing against their heart not being open enough to accept her love. A ying to the cover’s yang (or vice versa). It’s really strong as a result, something I can return to time and again and pick something slightly different up on (for instance, I’ve only just noticed that there is a 3 note electronic phrase in the background of this which will appear in the foreground of another Orbit production – bunnied though). I’ve had a great morning listening back to Ray of Light. Another personal highlight is Drowned World – a terrific album opener, I think. To me in the 90s, Madonna was like Morrissey: someone who slightly older people seemed to think was a big deal but to my teenage ears just seemed to release loads of boring records. I had the attention span of a gnat so if something wasn’t big bold hooks, I really didn’t get it. It didn’t help that those of my peers who did like her contemporary stuff were generally Berghaus fleece-wearing Young Conservatives types. I should go back and give her later stuff a listen as I’ve warmed to this sort of eerie minimalism a lot more since (warmed is absolutely the wrong word here!) and also got into some of her earlier stuff whereas back in the 90s, anything 80s was deemed unforgivably naff. #31 Recently revisited the Northern Exposure mix myself as following the ‘Professional Widow’ entry I’d realised it features another Tori Amos sampling track in Rabbit In The Moon’s ‘Out Of Body Experience’. I probably like the general audiovisual experience of ‘Bedtime Story’ more than anyone else round these parts and in ’94 it felt very on point (as did her cover of ‘I Want You’ with Massive Attack) whereas ‘Frozen’ was a little bit lagging behind recent trends although evidently not to its real disadvantage and an interesting choice for first single off the album ahead of the euphoric title track I prefer. A couple of years on from this I’d heard Orbit’s ‘Strange Cargo Hinterland’ album far too much in the office of the company I worked at but it did seem like the primary inspiration for the Ray Of Light album’s sound (with Aphex Twin’s various ambient works not far behind). More of a triumph for William Orbit than Madonna who really had become passe at one point. I don’t know if anyone else remembers the awfully coy 12 rating on ‘Bedtime Stories’ which seemed to be trying to make some sort of point but no one cared. What was truly confounding about her 1998 return for me was hearing ‘Ray Of Light’ for the first time on Chris Morris’ beguilingly strange early hours show ‘Blue Jam’ and assuming it was some left-field club track (not recognizing the voice) and then being greatly impressed when it turned out to be Madonna’s next hit. I suppose ‘Frozen’ is alright and in many ways this stately pace suits her voice very well, but as an emotional freeze-frame it’s not quite up there with the outstanding ‘Live To Tell’. Back when we were discussing her first run of number ones I noted that Madonna was one of my blind spots, despite being pretty familiar with her work: I liked “Burning Up” when Australia made it her first top twenty hit anywhere, and had time for “Material Girl” and a few other hits, but with nothing like the fervour that many had for them and her. “Like a Prayer” briefly turned that around, but not enough to carry me through her mid-90s work. Then came the delirious ecstasy of “Ray of Light”, which immediately became my favourite Madonna song. I bought the album—the only Madonna studio album I own—and admired it, even if it was a little too long. Beyond the hints of Björk, Orbit’s touch left tracks reminding me of Sunscreem, Curve, or even Garbage, which were all good things in my book. I enjoyed listening to it again this morning, but the patchiness I heard in it fifteen years ago is still noticeable; it would have made a killer 10-track album. “Frozen” never leapt out at me before, but re-listening to it in isolation and then in album context has really lifted it; the hummed sections give it that ancient, Middle Eastern note that Madonna was going for (she cited The Sheltering Sky as a key influence at the time). But even though the songs on Ray of Light have the mature Madonna voice that I far prefer, I keep hearing hints of older Madonnas, from songs that never quite did it for me. It makes them teeter on the brink of sounding like Madonna-karaoke over somebody else’s songs. Intellectually I know that’s wrong, that these are her songs and that she deserves great credit for her choice of collaborators throughout her career, but instinctively it keeps me from giving “Frozen” more than a 7. “Ray of Light” would have been a 9. Bedtime story was an odd one inasmuch as because Bjork was one of the writers, I do hear her voice when bringing it to mind, as opposed to Madonna’s. I’m fairly sure Bjork hasn’t recorded her own version. #38 For a moment I thought you meant the King Crimson track The Sheltering Sky. Imagne if that had influenced Madonna. Except I’ve just read the Crimson track is also influenced by the book (which the movie was based on). So there you go. Two very different tracks influenced by the same source. SWANSTEP- I can appreciate that view, but, I dunno- I thoroughly enjoy Immaculate, even though the it’s not the ‘definitive” versions of the songs. Madonna clearly wanted to spice it up a bit at the time. Celebration is a good collection, but I don’t love the random tracklist. And thanks fort that “Frozen”/”Let It Go” link- will check it out. @37 Hawkwind comparison is exactly right, yes. Same is true of the Chemical Brothers from around the same time. When ‘Ray of Light’ starts I always expect it to be ‘Boys Don’t Cry’. @Ed, 42. Ha, when a 2002 Eminem bunny begins I always think it’s The Cure’s ’10:15 Saturday Night’. The worst thing I’ve ever heard for triggering ‘Hey, I know this one…’ reponses all over the place was a track on Interpol’s first album, Say Hello To the Angels. You almost get whiplash during the first 50 seconds as the track cycles through various influences. There are at least 5 quotes in there, only 3 of which I can pick right now: it’s ‘Edge of Seventeen’, no it’s ‘London Calling’, no it’s “This Charming Man’…I quite liked that album, but this track was always too much. Ugh, listening to Interpol’s Turn On The Bright Lights for the first time in ages again now, it’s sounding awful to me (so few ideas of any sort). Makes me think I was out of my mind in the early ’00s that I thought relatively highly of it then. Oh well. Madonna + trendy producer = virtually guaranteed Number One? I’ve never liked the fact that she sounds like she believes that she not only deserves but *expects* to be worshipped as the One True Rightful Queen Of Pop. So it goes here, and she’s not helped by the song, which starts interestingly but has no clear idea of where to go and just gets boring in the end, despite the details of the production. FIVE. How was Orbit a trendy producer? he had remixed her several years prior to Ray of Light, but it’s not like he was Timbaland. In terms of females in pop, it’s been Madonna and The Rest, based on what she’s done in her work to make pop music actually mean something (in addition to it being great stuff, for the most part). Queen Bee syndrome, as it applies to Madonna, is the fault of the media far more than it is her – the assumption (which you still get a lot) that successful women in pop must all be bitter rivals or that there’s only one clearly predominant ‘queen’ at a time. Which isn’t to say that Madonna’s self-confidence (or ego, if you like) is small. At any given moment in pop, you suspect she believes that she’s the best thing in it, or at the very least she is aiming to be and believes she has every chance of hitting that goal. But you could say the same of Prince, Bono, Kanye, Lennon, etc in their day. When Madonna collected all her Grammys for the LP she had Orbit up on stage with her and introduced him to the audience – his gangly sheepish appearance was quite amusing and it didn’t seem like he enjoyed being in the limelight at all – bless. #50 Still a bit confused! In the first comment you seem to be talking about Madonna’s own attitude, but here you’re talking about the fans’ attitude? Like most pop stars, Madonna has fans, and fans are likely to see the good in flawed records more than non-fans are (it’s kind of the definition) but that’s not really M’s fault. With Madonna I think she gets a lot of critical fascination around even her worse records because to an extent she seems to think like a pop critic. She has clearly always thought very hard about styles, trends, what her next move needs to be, how it fits within the rest of pop – and since at least 1985/6 has been in a position to act on that with an unusual level of autonomy. In fact, she thinks a lot more than most pop critics because she’s considering the visual and fashion aspects so much too. Bowie is another example of this – and like Madonna gets cut a great deal of slack for it. @52: I’m not surprised you’re confused – looking back at what I wrote I’ve no idea what I was trying to say either. That’s what I get for trying to make sense so soon after a long and arduous delayed plane journey while simultaneously trying to write a Forth interpreter in Ruby (don’t ask). Anyway, my point is that I don’t share the love for Madonna which so many people – whether critics, media commentators, or contributors to Popular – have, and the effect of reading so many largely uncritical reviews of her work (and I’ve seen many) is that I get reminded of the sort of unthinking criticism I was trying to lambast earlier, even though it’s not necessarily fair (definitely not in this case) to conflate the two. The problem is that there’s something in the way she sings which to me sounds altogether too carefully planned out and calculated to win approval – I found “Vogue” too self-consciously clever, for example – and this invariably gets in the way of any appreciation I’m supposed to have for whatever it is she’s trying to do. Of course, other people have similar problems with other artists; mine in this case just happens to be very much a minority opinion. Thank you, o kindly gods of Popular, for sending me off on an Orbit binge at Wikipedia the other day, because after reading about the quickly-deleted 1995 version of Pieces in a Modern Style I looked it up on Amazon and found one copy going for far less than the usual £30+, and ordered it on impulse, expecting that I’d end up with a second copy of the 2000 version instead… and here it is in the post today, the 1995 version, with his unapproved take on Arvo Pärt’s Fratres in all its glory. Wheeee! If you’re looking for William Orbit productions, there’s always Belinda Carlisle’s debut album… she was born the day after Madonna, you know. My opinion of this song has really shifted over the years. When it first came out I was young enough that the video was genuinely spooky – Madonna as a dark witch wandering some desolate wasteland – and I couldn’t get past that. When I was about 14 I really liked, but I was in one of those self-important phases when I liked anything with strings and minor chords because that moody stuff was surely PROPER MUSIC. Now… it leaves me a little bit cold (appropriately enough obvs). My favourite thing about Madonna was always her confidence and assertiveness – on the 80s stuff, that force of personality is thrilling. The problem is, it can easily become overbearing. When I listen to Frozen now I don’t think of her trying to break through to a distant lover; instead I get the impression she’s a born-again hippy telling me off for being, like, a total breadhead (“You’re so consumed with how much you get”). I accept this might just be my problem. It’s certainly not a very generous reading. It just feels a little bit like bumping into an old friend at a party, listening to her talk for 20 minutes about school catchment areas and organic markets, and ending up with the guilty, nagging thought that she used to be more fun than this. Incidentally, while this is very good, Madonna’s astounding cover of “I Want You” with Massive Attack a few years earlier makes me very sad that she never did a full album with them producing.